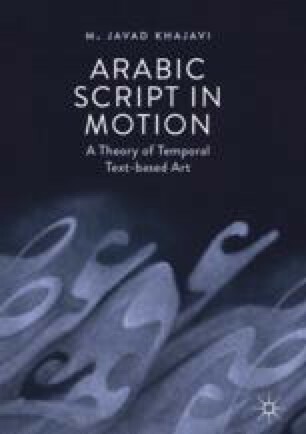 This chapter starts by differentiating between artifacts in which calligraphic forms do not display any kind of temporal behavior and those in which verbal units undergo kinetic events. Kinetic behaviors, as the simplest form of temporal events, are then introduced. It is explained that in kinetic behaviors, while verbal units may undergo movement or change, their shapes remain intact. A few examples of time-based calligraphic art and animated typography, in which words and phrases display kinetic behaviors, are presented. The differences between static and kinetic compositions are explained. Finally, the issue of legibility and readability with regard to the category of kinetic behaviors is explored.